As the world of work and jobs is more uncertain than ever through the rise of robotics and the gig economy, Co-operatives and the World of Work furthers the debate on the future of work, sustainable development, and the social and solidarity economy of which cooperatives are a fundamental component. Throughout the book, the authors, who are experts in their respective fields, do not limit themselves to praising the advantages of the cooperative model. Rather, they challenge the narrow understanding of cooperatives as a mere business model and raise debate on the more fundamental role that cooperatives play in responding to social changes and in changing society itself. The book is unique in tracing the historical connection between cooperatives and the world of work since the end of the First World War and the recent shifts and restructuring in enterprise and the workplace. 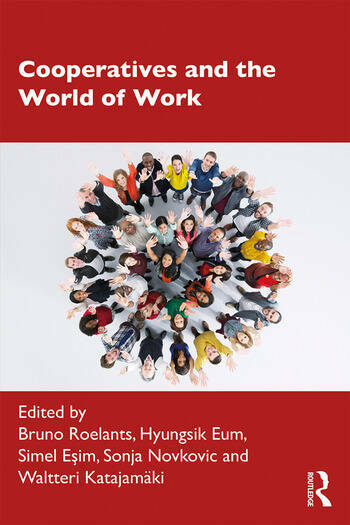 It presents a redefinition of the very concept of work, focusing on organizational innovation. This book is published in recognition of 100 years of the International Labour Organization, and gathers together research from leading experts who were brought together at an event co-hosted by the International Co-operative Alliance (ICA) and the International Labour Organization (ILO). Bruno Roelants is the Director General of International Co-operative Alliance and was formerly Secretary General of CICOPA and of its regional organization CECOP CICOPA-Europe. Hyungsik Eum is the Data Analyst at CICOPA Europe (European Confederation of Industrial and Service Cooperatives) and Strategy and Statistics Coordinator of the International Co-operative Alliance. Simel Esim is the Head of the Cooperatives Unit of the International Labour Organization in Geneva. Prior to this, she was a Senior Technical Specialist in the ILO’s Regional Office for Arab States. Sonja Novkovic is Chair of the Committee on Cooperative Research of the International Co-operative Alliance Research Committee. She is also the Academic Director in the Co-operative Management Education program and Professor of Economics at Saint Mary's University in Halifax, Canada. Waltteri Katajamäki works at the International Labour Office in Geneva as a Technical Officer on Rural Economy and previously worked at the ILO’s Cooperatives Unit.